I come to this magnificent house of worship tonight because my conscience leaves me no other choice. I join you in this meeting because I'm in deepest agreement with the aims and work of the organization which has brought us together: Clergy and Laymen Concerned About Vietnam. The recent statements of your executive committee are the sentiments of my own heart, and I found myself in full accord when I read its opening lines: "A time comes when silence is betrayal." And that time has come for us in relation to Vietnam. 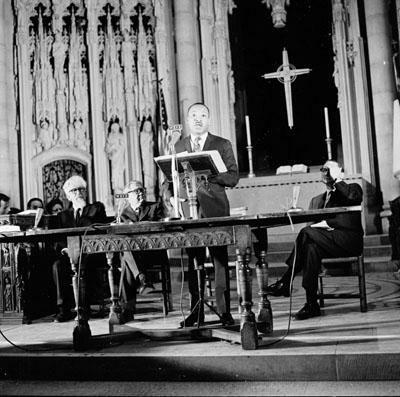 As if the weight of such a commitment to the life and health of America were not enough, another burden of responsibility was placed upon me in 1954;1 and I cannot forget that the Nobel Peace Prize was also a commission, a commission to work harder than I had ever worked before for "the brotherhood of man." This is a calling that takes me beyond national allegiances, but even if it were not present I would yet have to live with the meaning of my commitment to the ministry of Jesus Christ. To me the relationship of this ministry to the making of peace is so obvious that I sometimes marvel at those who ask me why I'm speaking against the war. Could it be that they do not know that the good news was meant for all men -- for Communist and capitalist, for their children and ours, for black and for white, for revolutionary and conservative? Have they forgotten that my ministry is in obedience to the One who loved his enemies so fully that he died for them? What then can I say to the Vietcong or to Castro or to Mao as a faithful minister of this One? Can I threaten them with death or must I not share with them my life? Each day the war goes on the hatred increases in the heart of the Vietnamese and in the hearts of those of humanitarian instinct. The Americans are forcing even their friends into becoming their enemies. It is curious that the Americans, who calculate so carefully on the possibilities of military victory, do not realize that in the process they are incurring deep psychological and political defeat. The image of America will never again be the image of revolution, freedom, and democracy, but the image of violence and militarism(unquote). 1 King stated "1954." That year was notable for the Civil Rights Movement in the USSC's Brown v. Board of Education ruling. However, given the statement's discursive thrust, King may have meant to say "1964" -- the year he won the Nobel Peace Prize. Alternatively, as noted by Steve Goldberg, King may have identified 1954's "burden of responsibility" as the year he became a minister. Research Note: This transcript rechecked for errors and subsequently revised on 10/3/2010.